This essay is the first of a six-part collaboration between Benjamin Bovarnick (FES ’18) and Sara Harari (FES ’19, SOM ’19). The collection closely examines the barriers facing adoption of new, advanced energy technologies that can revolutionize electric grid operations and utility business models and spark potential solutions to elicit faster transformation in this expansive industry. When Tesla unveiled the utility-scale Powerpack battery in 2015, analysts and observers excitedly proclaimed the product’s low price point would revolutionize electric grid operations and business models as it set new cost benchmarks for energy storage. But despite the hype, the reception from utilities was tepid at best. This experience is not unique to Tesla. It leads to a big question: What’s stopping utilities from quickly pivoting to new energy technologies? Unlike other industries that can quickly adopt new technology, utilities and their regulators must make more cautious deliberations. Utilities operate differently than other industries. They must balance service obligations, regulatory oversight, and investor preferences. And utilities must navigate relationships with third-party stakeholders and technology providers. In this series of articles, we will closely examine the barriers facing adoption of new, advanced energy technologies that can revolutionize United States electric grids and utility business models. Through interviews with key stakeholders, we will highlight solutions to stimulate transformation in this expansive industry. Let’s kick things off by looking at the key stakeholders in this sector and their top priorities. Utilities come in all shapes, sizes, and structures. 68 percent of people in the United States get their electricity from investor-owned utilities (IOUs). IOUs are owned and managed by shareholders who receive a regulated return on investment. After IOUs, government-owned-and-operated utilities serve the next-most electric customers. Municipal utilities are owned by local governments and managed by elected officials or public employees. They only serve customers within their municipal boundaries or in immediately surrounding areas. State public power authorities like the Long Island Power Authority and federal power marketing administrations like the Bonneville Power Administration also own and operate electric generation and transmission infrastructure on a not-for-profit basis. 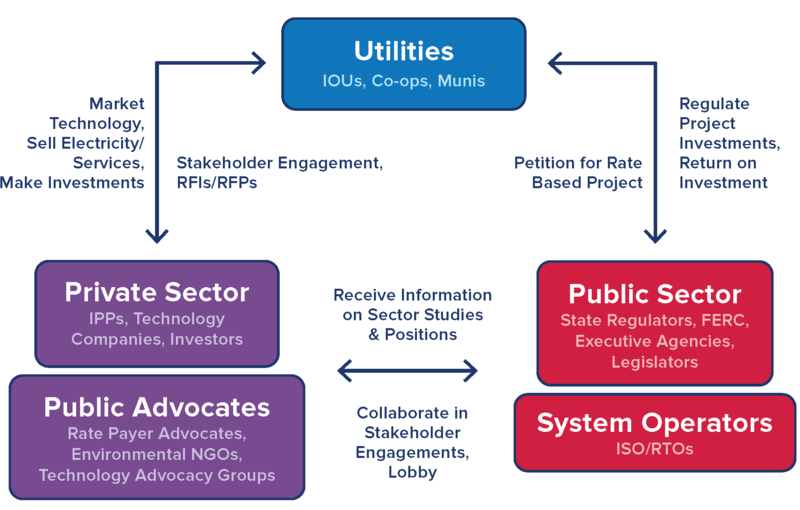 Finally, utility cooperatives are nonprofit utilities that are owned and operated by their customers. This allows the customers to have greater influence over utility operations. Co-ops are particularly prevalent in the central and western United States. Electric utilities may operate as electric generators, manage transmission and distribution services, or do both. The nature of each utility’s role depends on its state’s regulation. It also depends on whether the state permits vertical integration. Vertical integration allows utilities to provide generation, transmission and distribution services. Historically, state regulatory commissions oversaw electricity markets within state borders. These regulatory commissions allowed utilities to operate as regulated monopolies which could provide customers with electricity generation, transmission, and distribution. In the 1990s, some states chose to deregulate their generation markets. This allowed competition between existing utilities and independent power producers. In states that deregulated their electric sectors, utilities are barred or limited from simultaneously owning electricity generation and operating distribution services. What are their roles in advanced-energy-technology adoption? Utilities play a central role in fostering demand for new technologies. As electric grid owners and operators, utilities have a crucial say in what is deployed onto the system. Decisions about how to maintain a reliable, cost-effective grid are largely defined by utilities. When new hardware such as smart meters or software like blockchain data collection is developed, utilities are responsible for evaluating, financing and installing these systems. They must determine how long-term planning decisions incorporate new technologies. This includes evaluating whether new energy technologies will achieve the reliability and maturity demonstrated by conventional technology. Many innovative technologies have a higher perceived risk that can make utilities cautious. Utilities may also hesitate to adopt technologies if they are uncertain regulators will permit recovery of the investment. Utilities are obligated to provide safe and uninterrupted electricity access to any customers within their service territories. This electricity must be provided at “just and reasonable” rates and in an indiscriminate fashion. These obligations form the foundation of the “regulatory compact,” an agreement between the utility and its regulators. The regulatory compact gives a utility the right to operate in a protected, uncompetitive market territory in exchange for meeting its obligations. This structure allows IOUs to recover operating expenses and earn a “reasonable” return on new investments. Utilities are compelled to satisfy their side of the regulatory compact in the most efficient and effective way possible. However, policymakers and regulators can heavily influence utility actions to maintain this compact. Public officials may also dictate the investments utilities can make. There are many different government entities that help regulate and guide energy policy. These groups can range from local public officials to international agencies. PUCs: Each state has a Public Utility Commission (PUC) or similar entity responsible for regulating the rates and services of utilities. Commissioners can be appointed or elected depending on state laws. When a utility wishes to recoup expenses through ratepayers, the costs must be approved by the PUC. For instance, if a utility wants to install smart meters throughout its distribution network, the utility can petition the PUC to allow it pass the cost along to its customers through electric rates. This gives the PUC a linchpin role in many of the debates surrounding technology adoption. State PUCs regulate other utility services such as natural gas and water, but this series focuses exclusively on their electric regulation. States: The policy directives from state elected officials and state agencies can change with each election. Some public officials may advocate for incorporating renewable energy and new technologies to the grid. Other officials are more sympathetic towards maintaining the status quo. In either case, motivated elected officials can influence the way regulators and utilities gauge new technologies. State regulatory bodies generally operate on an independent basis from elected officials. However, they can make policy decisions or recommendations based on directives from elected officials or legislation. FERC: The United States Constitution gives the federal government oversight in inter-state trade matters. 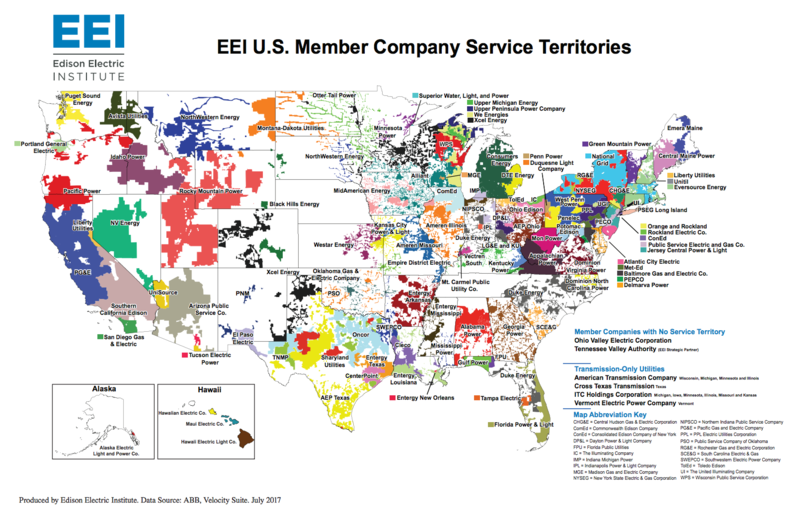 As energy flows freely between states, particularly those within the same electric transmission regions, the Federal Energy Regulatory Commission (FERC) also has a say in how the grid is operated. FERC issues standards on interstate energy transmission and electricity wholesale markets. Although FERC does not typically deal with the day-to-day operations of electric utilities, the commission can have a clear influence on what technologies utilities decide to invest in. This influence stems from decisions the commission makes on who can compete in electricity markets and what technologies get rewarded for participation. Although utilities ultimately decide what technologies to adopt, government entities can have enormous sway over their investment decisions. Open communication channels between utilities and public officials can create more achievable policy measures. Some of the most interesting programs we plan to review in this series come from states where the utilities view government entities as partners and collaborate on new programs. Legislators and executive agencies are public servants who are responsible for serving their constituents. Often, they must confer with industry leaders, academic experts, and advocacy organizations about the role of new technologies. This can help public officials better understand how different policies can optimally benefit their communities or society at large. When working with the electric industry, public officials may push utilities to adopt specific agendas. They may support more environmentally friendly technologies. They may encourage efforts to reduce electricity costs as much as possible for consumers. They may support investments in infrastructure resiliency to mitigate potential power outages. Often, these priorities may contradict each other. For instance, a more resilient grid may result in a higher electricity price. Policy makers must weigh competing priorities to chart a course that best serves their constituents. PUCs and FERC have more narrow priorities. They are expected to work with electric transmission operators oversee energy markets and regulate infrastructure investment. Their mission is to ensure electricity markets operate reliably and efficiently. They uphold the regulatory compact that exists between utilities and their customers. They evaluate how changes in grid infrastructure might compromise or impede optimal service. PUCs are also responsible for maintaining reasonably low rates by approving prudent grid investments. NERC, ISOs, and RTOs: The North American Electric Reliability Corporation (NERC) is a nonprofit that covers the United States, Canada, and parts of northern Mexico. NERC ensures the reliability of the bulk power system through a series of operational standards. 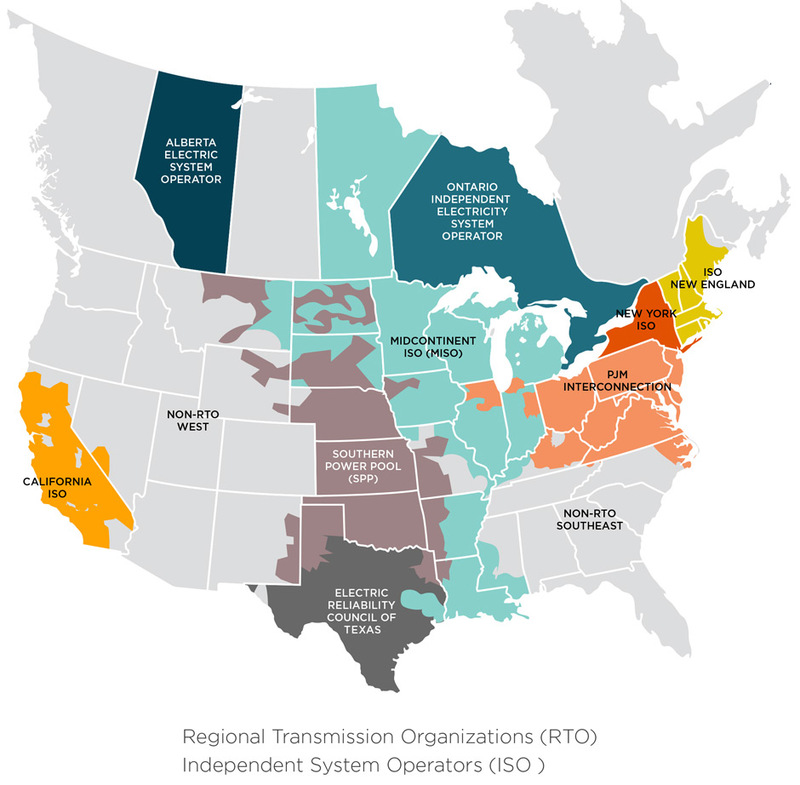 There are nine independent system operators (ISOs) and regional transmission operators (RTOs) within the NERC region, seven in the United States, and two in Canada. These ISOs and RTOs support electric grid reliability and operate wholesale electricity markets. The NERC, ISOs, and RTOs are also responsible for regional assessments of future growth. They must ensure that there will be sufficient power in the future to supply load growth. In parts of the country that do not fall within an ISO or RTO territory, vertically integrated utilities operate the regional transmission infrastructure. They also conduct independent projections of future electricity demand. The rate base is the electric generation, transmission and distribution infrastructure that utilities own for the purpose of serving customers. It is known as a rate base because utilities calculate the electric rates they bill to customers based on the cost of these investments. When a utility wants to develop new infrastructure projects, it will typically submit a petition to the PUC to include these new investments in the rate base. Including a new investment in the rate base helps the utility ensure a steady return on the investment and mitigate risk associated with the project. This petition is often examined by a state-designated ratepayer advocate who considers whether the investment should result in electric rate increases for utility customers. This can help limit the degree to which electric customers see their bills rise after newly proposed utility investments. Electricity Advocates: Many other groups also work to influence electricity planning and procurement decisions. These groups include environmental advocacy groups, professional organizations, equipment vendors, and industry lobbyists. These organizations can play a vital role in enabling stakeholders to influence technology decisions. Technology Entrepreneurs: Anyone developing the next new advanced energy technology, from world-renowned companies like Tesla to three guys in a garage, has an interest in electric grid planning decisions. New technology is being developed all the time and most of it, for one reason or another, never makes it to the prime time. Technology entrepreneurs can improve their chances of success by understanding how utilities and regulators consider the role of new technologies in planning and investment decisions. Independent Power Producers: In deregulated states, utilities are generally subject to limitations on the generation that they can own. Independent power producers (IPPs) own and operate power plants in these states. They sell power to customers under bilateral contracts or to the wholesale electric market through ISO markets. Power plants must be certified by utility regulators before they can sell to the market. These companies operate similarly to electric-generation utilities and are often subject to similar wholesale-electricity-market regulations. However, they do not set regulated prices for electricity and they are not bound by the utility regulatory compact. Private Equity: Companies that invest in the energy sector, whether in traditional utilities and power plants or in advanced-energy-technology developers, also have a vested interest in technology adoption. Private equity investors can hold incredible sway in technology adoption. Attracting the interest of equity investors can mean the difference between a good idea and an actionable reality for new technologies. Each stakeholder, according to their priorities, may advocate for or attempt to block advanced energy technology. Advanced energy technologies will generally, due to their nature, have an uncertain impact on the grid. This leads to heavy debate between all parties about whether different technologies should be incorporated, how to fund demonstration projects, and what is the best way to minimize risk. Independent system operators typically favor technologies that will maximize electric grid reliability and future planning abilities. Ratepayer advocates generally support investment and planning decisions that minimize increases in electric rates, and optimize service for ratepayers. Environmental advocates seek to promote more sustainable and environmentally friendly technologies and practices. Technology entrepreneurs develop advanced energy technology and seek new market opportunities to deploy their products. These efforts may or may not be advanced through regulatory reforms. Private equity can sometimes sponsor this action. Independent power producers may have more flexibility to adopt new technology than a traditional utility, but they incur all risks of upfront capital investments. They cannot recover these costs from ratepayers. Stakeholders are rarely uniform in their interests, particularly when compared with the other sectors highlighted in this piece. Each organization represents the interests of their communities or investors. ISOs and RTOs may prioritize investments in grid reliability. Meanwhile, technology entrepreneurs are interested in new pilot programs. Ratepayer advocates tend to resist new investments if the cost burden will be borne by customers. Environmental advocates prefer that investment decisions include metrics for the costs of environmental degradation. These priorities do not necessarily conflict with one another, but they may compete at times. The competing preferences of stakeholders can add complexity and challenges to utility planning processes. The relationships between electric-industry stakeholders provide the foundation for collaborative approaches which can optimize electric grid operations and services. Understanding the competing priorities of different stakeholders as well as the unique insight each party provides can help accelerate integration of advanced energy technologies into utility infrastructure. In forthcoming articles, we will delve further into the specific roles of these stakeholders and the ways that each party can help overcome the barriers facing advanced energy technologies.